Posted originally on: October 15, 2016 by	James. Last modified: November 14 2018. There are comments. If you’re a digital nomad visiting Thailand, this ultimate guide should help you get data on your phone as soon as you arrive in Thailand, wifi on your computer and even the mythical Super Wi-Fi fibre speeds, and all at a super low cost price. With data support for your phone, finding your way around is much easier as well as finding cool hangout spots, meeting up with friends, as well as documenting your trip. UK phone networks charge something like £2-4 per MB of data in Thailand – so for the same price you can get a few GB of data in Thailand. Its a no-brainer to buy a SIM! I am a big fan of AIS. They give consistent 3G/4G signals, even on the islands, even out in the middle of the sea. They have basic data plans, but with some hacks and codes, you can get a lot of data and fast speeds. In Chiang Mai, AIS sponsor the biggest free coworking space (CAMP), plus have Super WiFi hotspots in various places, so I think its a strong network to be with. 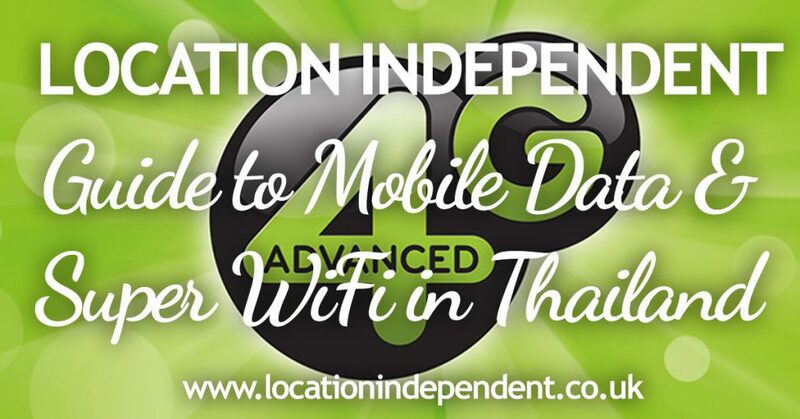 When I was on Koh Samui, I found True/3BB had a lot more WiFi hotspots you could connect to, but you can login to most of them with your AIS details for a small fee (25 baht per week). So AIS seems to be the best in my opinion. If you find yourself in a place that you need to change SIMs, its a few hundred baht to swap, so not a big mistake or change to make. Coming in to Thailand, you will most likely find yourself in Bangkok Suvarnabhumi International Airport. I would strongly advise you to buy your SIM as soon as you exit Arrivals. Why buy at the airport? To buy an AIS SIM card at Bangkok Suvarnabhumi International Airport, visit the AIS stand in the International Arivals Hall between gate 6 and 7. The AIS Store at Bangkok International Airport – this is where to buy a SIM card! Depending on the sales agent dealing with you, they may make you buy a SIM card package first, then apply credit and then a package, or they just apply a package to an empty SIM. Wait and see, but “This is Thailand” so don’t expect consistency, hopefully some of the below will guide you. As an estimate, you will spend 200-300 baht on your mobile plan per month, so perhaps add this amount as credit at the stand. 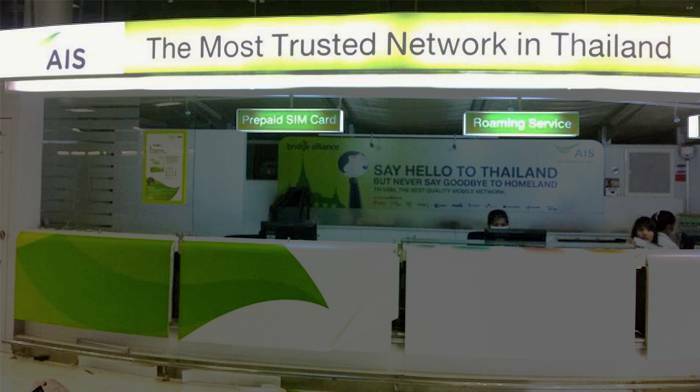 To buy a SIM Card at Chiang Mai International Airport, head to the International Arrivals section of the airport. Its a 2-3 minute walk from domestic arrivals (Chiang Mai airport is a very small airport). Directly opposite the international arrival doors, there is a small shop called AIS Buddy. This is the only mobile phone shop at Chiang Mai airport, and will try to sell you a tourist SIM. Thailand has a plan for everyone – as in, there are about 50 million different packages you can use. OK, maybe not that many, but its certainly not easy to understand, so don’t worry if you get confused straight away. As a tourist just arriving you can only get prepaid (“pay as you go”) SIM cards. The plans come in two formats – daily usage and monthly usage. I would avoid daily usage plans unless you are very very tight on cash and rarely use your phone, and as a “farang” the shop attendant will assume you want monthly. The AIS Traveller SIM (tourist SIM) includes lots of stuff, but at a slightly inflated price and features only last for 7-14 days. They are great if you are in a group and passing through Thailand for just 7 days, but practically this isn’t great for many digital nomads who may be staying longer. I have seen DTAC and True networks give away SIMs in Arrivals at the airport, and that seems like a great deal, right? But the top up and tariff you are on is over inflated so you will burn through credit much quicker. Maybe grab them if they are free (as a backup) but I wouldn’t use them unless desperate. AIS have introduced a new set of SIMs. A lot of these SIM plans are aimed at Thai customers, offering free internet use of certain apps, like Facebook, LINE, YouTube and Thai-only music and video streaming services. SIM cards are typically 50 baht plus any options you may activate. The Traveller/Tourist SIMs are 299 baht upwards. Includes: Unlimited usage of Facebook, LINE, WhatsApp, WeChat, Viber, Twitter. 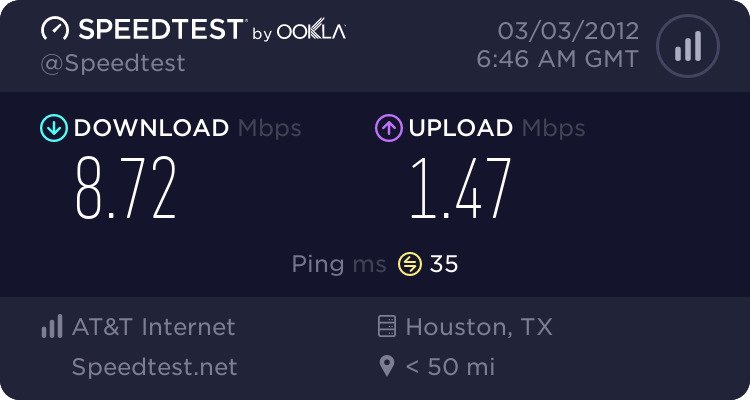 1GB internet p/m use only between 11pm-6am. Read the small print of any plan – for example, ZEEd SIM offers “6GB internet” but in the small print, this is per year and divided per month! Any plan you get will auto-renew one week/month from the date of activation. AIS have a range of data net packages that auto-renew each month. 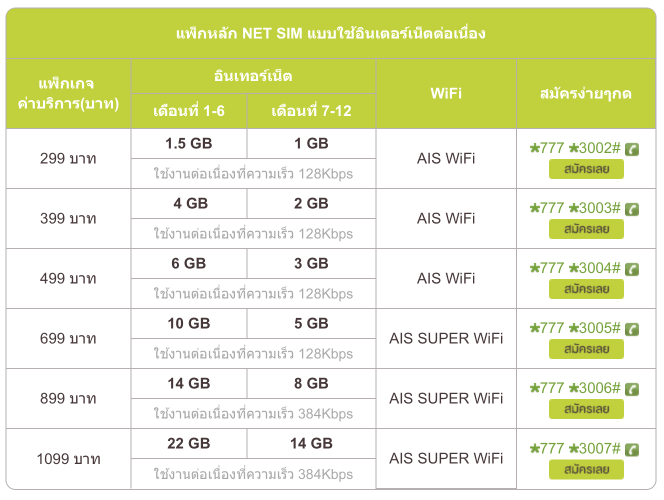 Add-on data packages start at 299 baht per month. You can see all the options on the AIS website. These packages are good if you want a solid guarenteed amount for a fixed cost with minimal work required. If you want maximum data for minimum costs, check out some of the deals below. They take a bit more work with top-ups, renews etc but not much more if you top-up your phone with a decent amount of baht. Dial the below code to get 4GB of data that lasts for 2 weeks. It will subtract 99 baht from your balance. If you are a heavy user, get 5GB to power through in 7 days by dialling the following. It will cost you 159 baht. There are lots of these codes, all available on the AIS website. AIS have Wi-Fi hotspots all over the place – malls, coffee shops, high streets, bars. They offer the ability to connect to the spots as part of many of their SIM card plans, or you can pay extra for access. 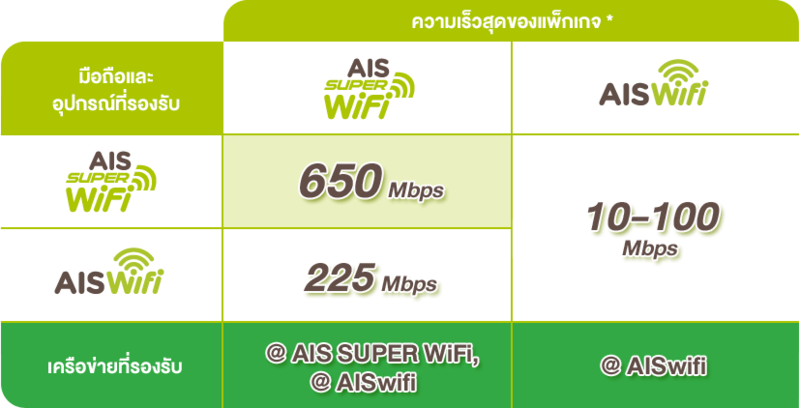 If you are working in Thailand, the AIS Super Wi-Fi is really worth investing in and seeking out – it adds a whole new dimension to your working speed! To access Super Wi-Fi you need to signup to it and you will probably get a new password sent through via SMS that you should use instead of your standard AIS Wi-Fi password. Once done, you will get a password sent to you via SMS so you can login straight away. If you are staying a longer time in Thailand and have already got a bank account, the very best deals comes on postpaid plans. Similar to a “contract” model, it means they bill you after use. To pay, go to an AIS shop and pay it there or transfer through any ATM machine. Its super straight forward. Postpaid plans offer by far the best options for the best value – AIS have just launched 4G MAX SPEED packages which are great. The package is half price for the first 3 months! Even the largest plan is only £20 per month! 75GB of data! I opted for the 488 baht package – 10Gb of data + Super WiFi + 300 mins of calls. 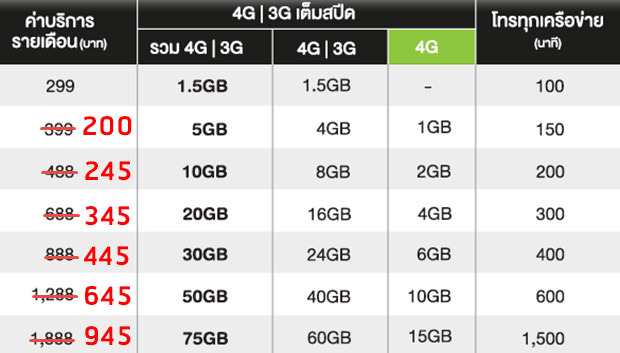 So with the offers applied – I am getting 20GB of data + Super WiFi + 300 mins of calls for just 245 baht per month! Some of the often asked questions I’ve heard. Got a question? Drop it in the comments. Why are the text messages I get from AIS in Thai? You can change these to English by dialing *700 on your phone. More information on this is on the AIS website but its hard to follow so you are better off just phoning the number. Do the SIM cards allow tethering? Yes. As far as I know, all the networks allow tethering so you can connect to your phone and use the data from your laptop. How do I top up my phone or check my usage? You can login on the AIS website – you use something called eService (located at the top corner of the page). Put your phone number in the box, it will text you a password, use this password and your number to login. For quick and simple ways to top-up, you can go to any AIS store. Every mall in Thailand should have one. Supermarkets like Tesco Lotus or Family Mart allow you to top-up (update: November 2016, you can no longer top up AIS at 7-11). 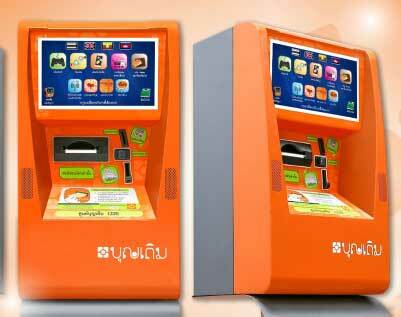 A large majority of small convenience stores have an orange machine outside – Boonterm top up machine – which allows you to add money to your account, and pay various other bills. AIS have customer support in English on the phone – dial 1175. You can also walk in to any AIS store or booth, tell them your problem, smile and nod and wait until they fix it – don’t get impatient or lose your temper. You can probably also go to any other mobile shop and they will help you – Thais understand how bloody complex their phones system are for non-Thais. 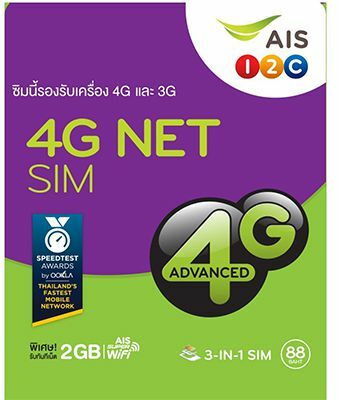 Getting a SIM card with data is easy and cheap in Thailand, the 4G Net SIM card is a steal at just 99 baht per week (396 per month – about £10). With the ability to quickly add more data any time, you will never not be able to work somewhere!